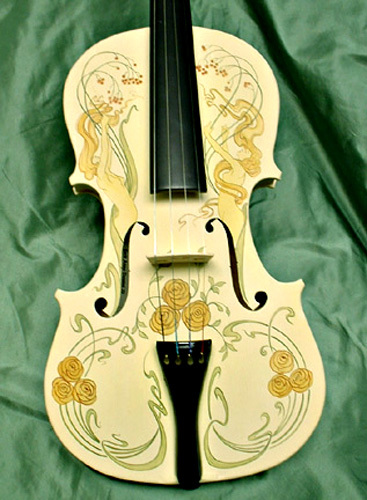 My inspiration for this violin came from Austrian Art Nouveau "Jugendstil" designs as well as those of the Wiener Werkstätte. I borrowed loosely from both traditions to come up with something evocative of the period without doggishly recreating an existing design. In particular, the artists Adolf Höfer and Lazar Nagy were a big influence and just to shake it up a bit, I also looked at some of the floral designs by Maurice Verneuil.